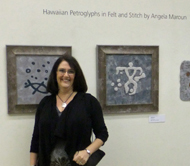 Much of the inspiration for my work comes from the years I spent living in Hawaii during college. I have created works depicting the colors, landscapes, flora and cultural aspects of the Islands. My current work is an exploration of ways to create texture and dimension on cloth and paper. 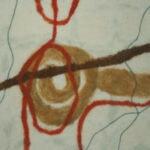 Creating layers on cloth with dye and paint, needle and wet felting, and dimensional embroidery are the tools I use to achieve the desired result.